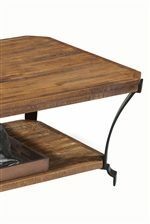 This beautiful contemporary sofa table is modern, with a rustic feel. The table top is made of reclaimed hardwoods, with natural distressing and color variation. 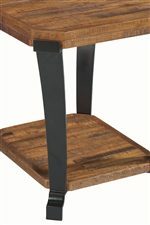 Simple high angular legs are made of hand-forged steel that has a dark oil rubbed bronze finish. A lower wooden shelf offers additional space for decorative display items. This gorgeous sofa table will give your living room unique character, and help you create the warm and inviting living room you have always wanted. The Kenwood Sofa Table by Flexsteel at AHFA in the area. Product availability may vary. Contact us for the most current availability on this product.